Explanation: Wine is made from grapes. 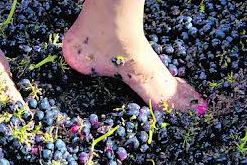 Traditionally (that is, a long time ago), grapes were “pressed” by stepping them ( did you see the scene in A Walk in the Clouds?) to get the juice out. “Whine,” which sounds the same as “wine,” means to complain a little bit about something. A child might whine about having to eat something he or she doesn’t like; you might whine if someone stepped on you, kind of like the grapes in the joke. This entry was posted in humor, Joke, jokes, jokes explained, kids jokes, reading, writing and tagged humor, joke, jokes, kids, kids jokes, reading, wine, writing. Bookmark the permalink.